Media: Soft cover, landscape format, 58 pages plus covers (incl. 2 pages in full colour). Advantages: Compact and useful format for modellers; summary coverage of entire Heinkel He 111 series; packed with helpfully captioned photos; attractive cover art - front and back; supporting narrative text. 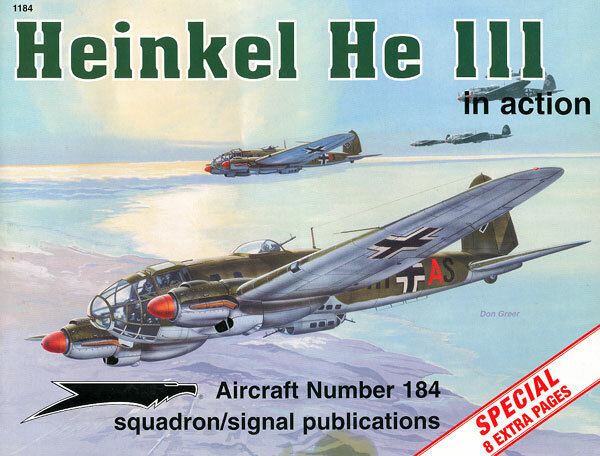 George Punka's Heinkel He 111 in Action follows Squadron/Signal’s popular “In Action” format with Don Greer cover art, colour profiles as a centrefold, helpful line drawings and specifications in landscape format. The original He 111 in Action book has been expanded to 58 pages, and these are packed with more than 100 contemporary photographs, 90 scrap-view drawings to illustrate features and distinguishing points of the He 111 plus ten colour profiles. As with the rest of the "In Action" series, the wartime photos are captioned in detail, providing a useful introduction to the development and service of this significant German aircraft.